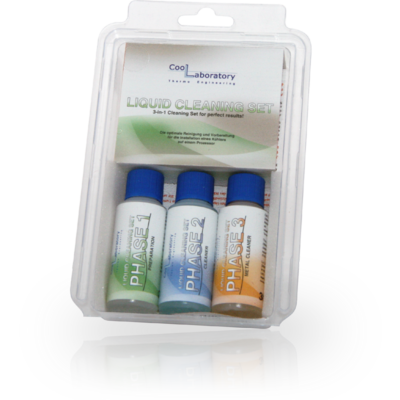 The Coollaboratory Liquid Cleaning Set enables a fast, simple and effective removal of impurities and residues of heat conduction pastes from metallic contact surfaces in PC-systems. It also prepares the surfaces of processors and coolers for the usage of a new heat conduction paste on base of silicone, glycerin or metal optimally. The Liquid Cleaning Set includes also a manual, some cotton pads and a plastic card.